I found out about bandcamp.com recently. I’m still exploring but I love the place already. It is a site designed to let people find music and directly support the independent artists who make it. After knocking about the site a bit, I noticed that they had an audiobook category. I was delighted to find all the audio from one of my favorite authors, Neil Gaiman. I signed up immediately. Sad to say, when I visited Mr. Gaiman’s bandcamp page a few days ago to get the next book on my list, it was gone. Most of his audiobooks are no longer listed. I hope they come back at some point. Coraline, a family favorite, is still there though. Anyway, though I found the thought a little frightening, I decided to put up the audio to a few of my stories. I put three up first: A Tower of Mortars, All Stories Become Ananse Stories, and Ananse’s Brother. Because bandcamp allows users to stream the stories for free, they got some listens right away. 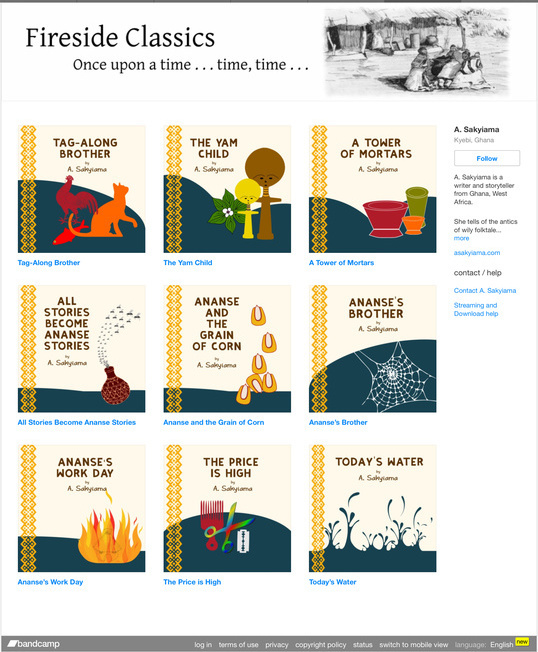 Encouraged by the feedback from a few people who found the first three and actually got in touch, I uploaded six more—all the stories from Today’s Water and Other Ananse Stories and two from The Yam Child and Other Tales From West Africa. You can listen to all of them for free on the website or in the bandcamp app for iOS and android phones. You also have the option to buy if you want to download the stories to your library for offline listening. One fan made my day when she bought all the stories and paid significantly more than the asking price to show her support. Happened a few weeks ago, but I’m still basking in the warm feelings. The audio-ebook is included as a bonus for each story in this first set. For now, that is the only way you can get one of my audio-ebooks. If you’re new to audio-ebooks (also called read-along books), my previous post has quite a bit of information. When you have a moment, please check out my page on bandcamp. Sit back and let me read to you. If you have questions, want to share your listening experience, or you just want to say hello, whatever the reason may be, please do not hesitate to get in touch. I would love to hear from you.